DataTracks today announced an impressive milestone with the acquisition of their 12,000th customer. With a growing suite of software and services, DataTracks is at the forefront of modern financial reporting, delivering Inline XBRL (iXBRL) reports across the world. "iXBRL is an important evolution in how our customers share information with their ecosystem of regulators and key stakeholders. With Inline XBRL, both humans and machines can interpret financial information filed in the same format and this opens up new avenues and possibilities for reporting, analytics and insights," said Karthik Sathuragiri, President, DataTracks. 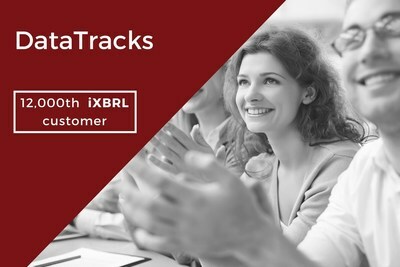 "At DataTracks, our vision is to enable new streams of intelligence for our customers while fulfilling regulatory obligations and this momentum in iXBRL filings is another example of our commitment to our customers." With this statement, DataTracks also announced that they worked on the preparatory iXBRL filing of a major accounting firm in South Africa to be filed with CIPC (Companies and Intellectual Properties Commission), the corporate regulator in the region. CIPC is mandating the filing of Annual Financial Statements in the iXBRL format from 1 July 2018 for all qualifying companies in South Africa. "As one of the first Inline XBRL solution providers accredited by HMRC in the UK (in 2011), our modular approach to product development has helped us launch Inline XBRL products complying with regulations in a number of markets including Ireland (Revenue) in 2012, the United States (SEC) in 2016, and South Africa (CIPC) in 2017," said Pramodh Vittal, the Vice President of Opportunities and Product Design at DataTracks. "With the recent field test in 2017 conducted by the European Securities and Markets Authority (ESMA) - in which we participated, and successfully created an Inline XBRL document for a company listed in the EU - we sense a growing acceptance and increased adoption of Inline XBRL by regulators around the world. The momentous advantage of data reporting being structured for machine interpretation and equally effective human readability is unmistakable."